While we were paying attention to the uncertainties of last year, like the presidential elections, fiscal cliff drama and Superstorm Sandy on the east coast, the Omaha office market remained steady marked by some positive and some negative outcomes. The stability is evident in a relatively unchanged vacancy rate, growing from 13.7% to 13.9% over 2012, and by comments from industry stakeholders that activity is high. On the positive side, Omaha’s office market experienced positive absorption of 273,651 sq. ft., the overall market size increased, in part because of construction of the corporate headquarters of CSG and Northstar Financial, and the announcement of more than 340,000 sq. ft. of headquarters buildings for three Omaha businesses, and average asking rental rates across all classes increased by $0.17. On the negative side during 2012 there were 21 fewer transactions and the overall square footage leased declined 141,000 sq. ft. from 2011. Tracking Omaha’s office occupancy/vacancy is conducted through Xceligent, a market database firm supported by Omaha’s commercial real estate industry. The database tracks 421 non-owner occupied buildings, up from 418 buildings one year ago. Buildings are added as they are constructed and buildings are sometimes removed when such buildings are demolished or re-purposed. These 421 buildings total 20,550,667 sq. ft.
As noted in our Summer 2012 report, Omaha’s office market saw its first speculative construction in years with the 105,000 square foot WestPlex building located just west of Westroads Mall. During 2012, construction was completed on CSG’s 208,000 sq. ft. and Northstar Financial’s 60,000 sq. ft. headquarters buildings. Construction continues on TD Ameritrade’s headquarters building which will open in 2013. Three Omaha firms announced new headquarters projects in 2012: a 131,000 sq. ft. building for Gavilon, a 100,000 sq. ft. building for Tenaska, and a 110,000 sq. ft. building which will be mostly occupied by Gordman’s. Omaha’s real estate market and economy continued to be buoyed by the success of homegrown businesses like these three leaders in their respective industries. The 2012 year-to-date net absorption is a positive 273,651 sq. ft. and only the third quarter experienced negative absorption. The office market absorbed 210,990 sq. ft. more in 2012 than 2011. 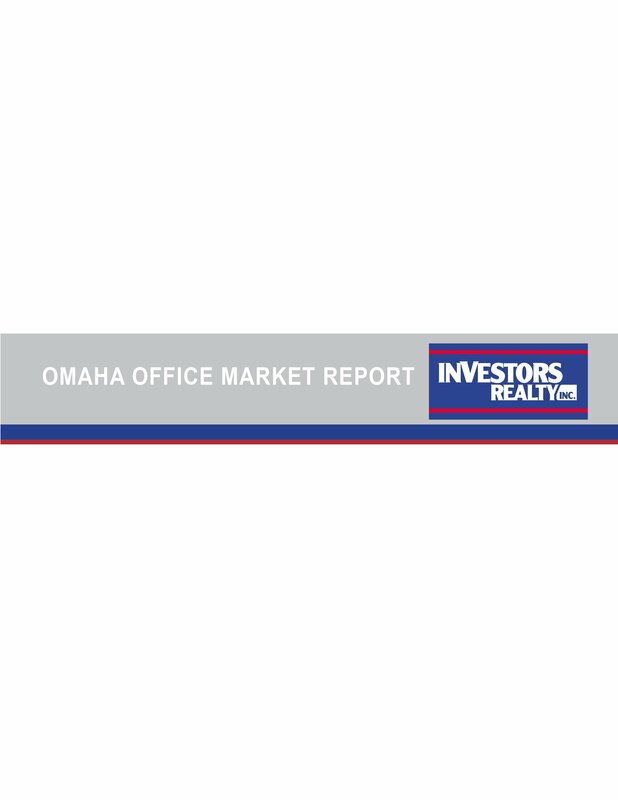 This is the third year in a row Omaha’s office market has experienced positive absorption. Remarkably, the largest new lease, 208,000 sq. ft. by CSG, contributed only 7,000 sq. ft. of positive absorption. In addition, Omaha’s office market experienced fewer leases of 1,000 sq. ft. or larger but most of that difference was in smaller leases resulting in a larger average transaction size. 2012 had 75 transactions totaling 860,323 sq. ft. down from 96 transactions totaling just over 1 million sq. ft. in 2011. These conflicting results of dramatically greater absorption with dramatically fewer transactions and less overall space leased suggests the times of businesses “right sizing” or leaving the market are behind us. We think businesses are planning for future growth and leasing space based on those plans. Increased overall asking rental rates in 2011 have continued in 2012, although the increase is marginal. The average asking rental rates across all building classes have increased by $0.17 per sq. ft. over the last 12 months. Class A properties experienced a decrease of $0.85 per sq. ft. Class B properties experienced an increase of $0.48 per sq. ft., probably as the result of a significant amount of North Park space coming on the market at $13.50 per sq. ft., triple net. Class C properties experienced a nominal increase of $0.09 per sq. ft. The average asking rental rate, quoted as FSG (Full Service Gross) by class is: Class A $23.81, Class B $19.10, and Class C $13.86, their highest since the first quarter in 2010. Triple net rates are ‘grossed up’ so that all rates can be compared as FSG. The Omaha office market had a 13.9% vacancy rate at the end of 2012, slightly higher than 2011’s rate of 13.7%, as a result of more Class B space being available. Class A properties continue to out-perform the market, posting a 5.3% vacancy rate. This is down significantly from 6.3% in 2011. The vacancy rate in Class B properties jumped from 13.8% at the end of 2011 to 15.2% and Class C property vacancy is 23.1%, down from 24.7% one year ago. In an effort to put Omaha’s results in perspective it might be helpful to look at five Midwestern markets of similar size. Milwaukee, Tulsa and Oklahoma City all boast slightly larger office markets and Des Moines and Little Rock have markets just smaller than Omaha. A quick looks indicates relative health of the Omaha market as it is positioned in the middle of the pack in its geography, total size, and in most vacancy measures. But while the data indicates Omaha is faring better than average in every measure except Class C vacancy rates, where its 23.1% vacancy rate is worse than all but Tulsa’s 24.2% rate, Omaha’s lead has slipped in the last year. Only Omaha and Des Moines saw an overall increase in vacancy rates in the last year, 20 basis points and 120 basis points, respectively, while the average of the six markets decreased 20 basis points. These are not dramatic figures but they could be cause for alarm if the trend continues. As mentioned above, Omaha’s large Class C vacancy rate is substantial. At 23.1%, Omaha’s rate is nearly 4 basis points higher than the average and is 2.5 times greater than Des Moines’ rate. On a positive note, we know that this rate has been shrinking steadily mostly because downtown Class C buildings have created opportunity for residential redevelopment. Good news is also found in Omaha’s Class A and B class properties, where nearly 17 million sq. ft. of Omaha’s 20.5 million sq. ft. office market lies. At 5.3%, Omaha’s Class A vacancy rate is better than all but Oklahoma City’s the Class B rates are manageable. Comparing these six markets confirms what we stated on the first page of this Market Report, that Omaha’s market can probably best be described as stable with some good news and elements of concern.